The reproduction bronze plated Dupondius coin of Nero was struck between 54-68AD and shows the head of Nero on the obverse and Roma in military dress on the obverse. The reproduction bronze plated As coin of Claudius was struck Circa 41-42 AD and shows the head of Claudius on the obverse and Minerva brandishing a javelin and holding a round shield on the obverse. 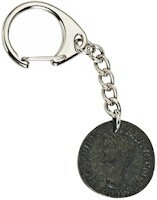 Each coin is supplied on a quality key-chain. Pewter wreath with gem in the centre supplied on a waxed cord. The information on the reverse of the card explains how wreaths were used in Roman times as well as the meaning of SPQR. Gold plated pewter owl supplied on a gold chain. The information on the reverse of the card describes Minerva the Roman goddess and the 'owl of Minerva' which is often depicted with her.